FEATURE: Are Authorities Ready to Enforce IMO2020? IMO 2020 is a big deal. And coming in the era of mass social media its meant there are suddenly a lot of people offering their opinion on what it all means. While it's great that more people than ever get to have their say, it also means there is a lot of misinformation and misunderstanding about the new 0.50% global sulfur cap. One such transgression that caught our eye recently was a shipping executive declaring that "there will be a 3-month grace period until March 2020 where owners must show that they have done the due diligence to change the fuel and they will not be penalised." That of course is not true. But if there are people in the industry who think that, what does that suggest about compliance levels come January 1, 2020? It begs the bigger question, is the industry ready for IMO 2020, and are the authorities ready to enforce it? To be clear, IMO has repeatedly said there will be no delay to the January 1, 2020 start date of the new rules. Sure, they flip-flopped on the ballast water regs just two months before they were supposed to come into force and that has some people worried the same will happen for the sulfur regs. But at this stage there is no mechanism that will enable IMO to backtrack. Even if, somehow, IMO was to delay the start of new sulfur regs the political fallout and damage to IMO's reputation would be unthinkable. Never say never, but the certainty that the IMO2020 global sulfur cap will enter into force on January 1, 2020 seems to be up there with death and taxes. What is the IMO 2020 Rule? To be clear, what this means is that from January 1, 2020 no vessel can burn marine fuel with a sulfur content higher than 0.50% unless it is operating with an exhaust gas cleaning system (scrubber) that enables it to achieve an equivalent level of compliance. Further, from March 1, 2020 no vessel is permitted to have marine fuel with a sulfur content higher than 0.50% onboard unless that vessel is fitted with a scrubber enabling it to achieve an equivalent method of compliance. There are a few edge cases, such as exceptions for special research, but these apply to so few as to not be relevant to the general discussion. IMO has made it very clear the above is going to happen, at least by the letter of the law. Whether there will be high levels of non-compliance remains to be seen. Key to this is enforcement, and what is not clear is exactly how that will work, let alone how effective it will be. Why would that be though when a global sulfur cap is already in force? The issue is that the current cap as set in 2012 is 3.5% having been reduced from the 4.5% sulfur cap set in 2005. As the global average HSFO sulfur content is around 2.7% it makes enforcement of the current global cap mostly a non-issue. Post 2020 will be very different as there will be an abundance of noncompliant fuel, a logistics network to deliver it, and significant incentives to use it. So while the idea of a global sulfur cap isn't new, the opportunities and incentives for not adhering to sulfur regs have so far been limited to ECAs. The Trident Alliance (TA), who have long campaigned for "robust enforcement of sulfur regulations for the benefit of the environment, human health and responsible business", notes that there are 91 states that have ratified MARPOL Annex VI and thus have an obligation to enforce IMO 2020. Of those just 31 have sulfur regulations in their own ports and waters and just 16 are IMO ECA countries. On a global basis this suggests there is not a lot of prior experience of sulfur regulation enforcement. Even for those with experience of enforcing sulfur regs, policing the great expanses of the oceans is very different to policing a relatively confined ECA. "Information on the approach to enforcement, including the details of how compliance checking will be done and the penalties for non-compliance are, with few exceptions, is hard to find," TA Chair Roger Strevens told Ship & Bunker. "Trident Alliance believe that this is a missed opportunity to deter non-compliance by sending a very clear signal of intent. The unavailability of this information does not necessarily mean that preparations for effective enforcement have not been made, but it is concerning, and we will continue to draw attention to this issue." There are many moving parts to IMO2020, including the ban on the carriage of non-compliant fuel for ships that do not have scrubbers. This will only come into effect on March 1, 2020, two months after the start of IMO 2020. But some believe that by even allowing ships to use scrubbers and continue to burn high sulfur fuel it has eased options for noncompliance and overcomplicated the enforcement picture. Ignoring the continuous data logging of the scrubber that needs to take place, the historical records of which can be checked at any time, it has been argued that a ship fitted with a scrubber could legally buy and burn HSFO without actually operating it. Given the only savings would be the cost of maintenance and of the energy needed to power the scrubber, it's questionable whether it makes financial sense to spend millions fitting one to then risk getting a fine just to save a relatively small dollar amount by not using it. The highest risk of noncompliance still seems most likely to come from whose who do not invest in scrubbers and continue to buy and burn noncompliant fuel, be that deliberately, accidentally, or due to ignorance. That said, Strevens does not believe adding scrubbers to the compliance picture has made enforcement any more difficult. "Determining regulatory compliance of a vessel equipped with a scrubber is not inherently more or less complex than determining compliance of a vessel using low sulphur fuels, but it is very different," he says. "The existence of fundamentally different compliance approaches only underlines the need for authorities to give close attention to compliance inspection training." So a Vessel is Non-Compliant. Then What? 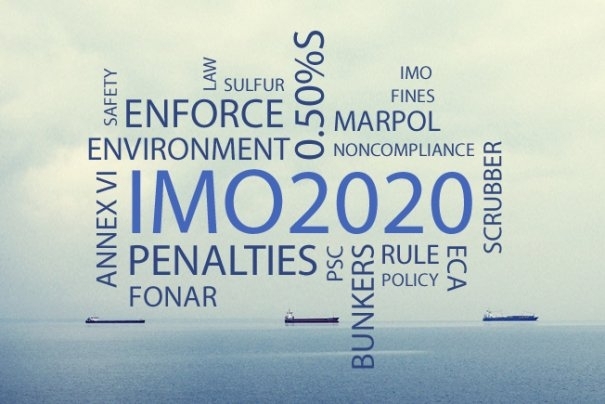 Should an owner be found to have broken the new IMO 2020 rule, it is unclear as to what fines and / or penalties will be imposed. IMO says "Sanctions are established by individual Parties to MARPOL, such as flag and port States. There is no established fine or sanction set by IMO – it is down to the individual State Party." However according to MARPOL, the penalties should be "sufficient to discourage violation." But this raises another question: should accidental and marginal non-compliance, gross and deliberate non-compliance, non-compliance due to ignorance, and non-compliance due to a lack of compliant fuel, all be treated equally? Strevens believes they should not, and that TA's position is that enforcers' should differentiate between those who deliberately and grossly contravene the rules, and those that are marginally and inadvertently in breach of them. Such an approach also makes sense given the often limited resources available for enforcing and the wide difference in overall impact in environmental and fair competition terms of these two cases. "What the approach to marginal vs gross noncompliance by the authorities charged with enforcement will be remains to be seen. From a TA perspective, we would hope that they would take a severe approach to companies who have clearly made no attempt to switch over in time; those who are still draining down the HSFO tanks after 1st Jan 2020," he says. "Shipping is not an exact science and is subject to many external effects that can change even the best laid plans. Therefore it does not make sense to impose the same severe penalties on vessels that are close to, but not actually below the 0.50% S limit on the dot of 1st January 2020, on the strict proviso that they have made and can demonstrate best efforts to be compliant." Less than eleven and a half months to go and still plenty to do then.